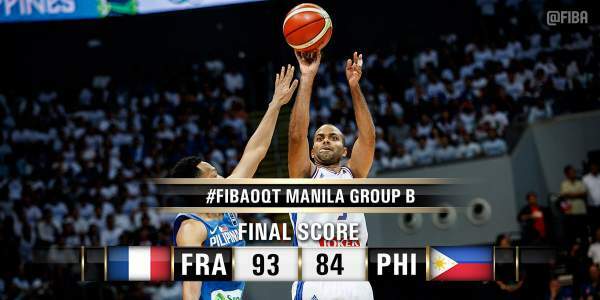 Video Highlights: Gilas Pilipinas falls to France | 2016 #FIBAOQT - Balita Boss! Gilas Pilipinas fell short against France in the first day of the 2016 FIBA Olympic Qualifying Tournament, Tuesday, July 5 at the Mall of Asia Arena. The Philippine national basketball team gave France a huge scare before the powerhouse team from Europe escaped with a 93-84 win. Nando de Colo led France with 27 points to go along with six rebounds, three steals and two assists, while star player Tony Parker also had a big game as he finished with 21 points and six assists. Andray Blatche paced Philippines with 21 points. Terrence Romeo played well with 19 point on 3-for-5 shooting from the three-point area, while Jason William Castro added 14 points. President Rodrigo Duterte was part of the sellout crowd as he graced the international sporting events. The 16th president of the Philippines himself did the ceremonial toss. FRANCE 93 - De Colo 27, Parker 21, Tillie 10, Lauvergne 10, Diaw 9, Gelabale 8, Diot 4, Heurtel 2, Kahudi 2. PHILIPPINES 84 - Blatche 21, Romeo 19, William 14, Chan 9, Rosario 6, Norwood 4, Parks 3, Reyes 3, De Ocampo 3, Pingris 2. President Duterte Graces the Gilas Opener!